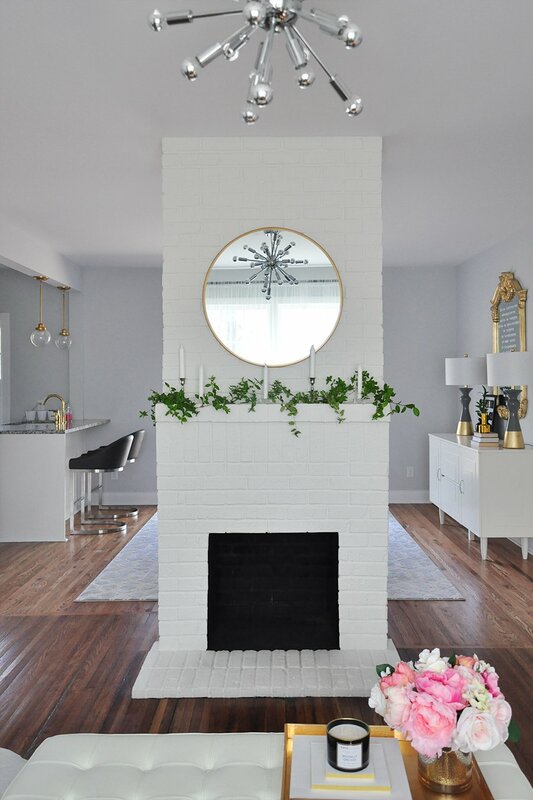 Sharing 3 simple ways to style your fireplace decor for spring. Best part? You likely already own all of these pieces! 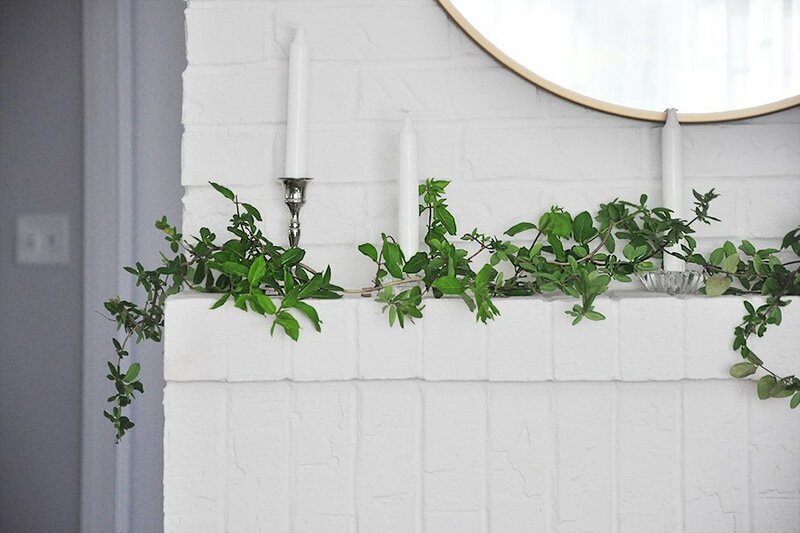 Raise your hand if the warmer temperatures, longer daylight hours and long-awaited sunshine are making you want to do all sorts of wild things – like trek barefoot across your overgrown yard in search of winding vines or blooming branches for your fireplace decor. That is precisely what I did this past weekend. Going barefoot was probably not my brightest idea, considering the poison ivy we fought so hard to destroy last spring is rearing its ugly head again. 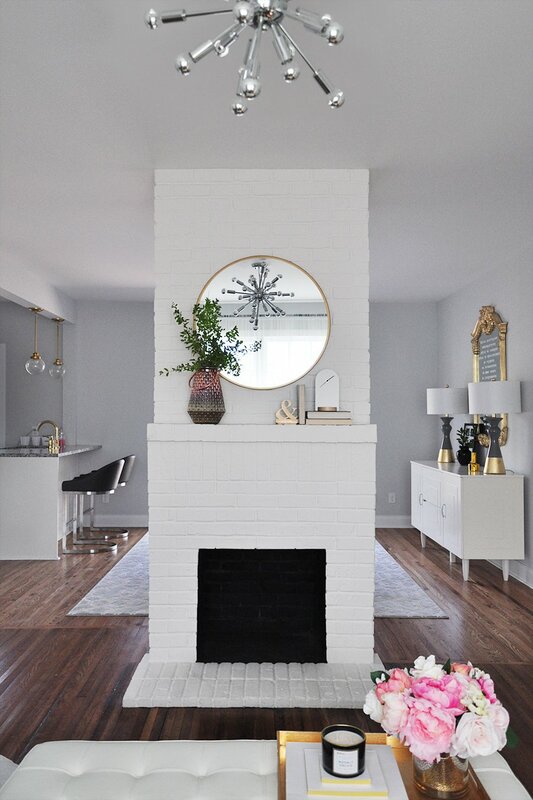 But as we say in Russia, “If you don’t risk it, you don’t drink the champagne” – the proverbial champagne, in this case, being your fireplace mantel styled for spring. The sun was shining. The birds were chirping. It occurred to me that maybe, possibly spring had finally sprung. Wasting no time, I made my way to the kitchen with the mission of brewing coffee, stopping by the dining room to flung open the French doors and breathe in the spring air. That’s when it hit me – the smell of spring. 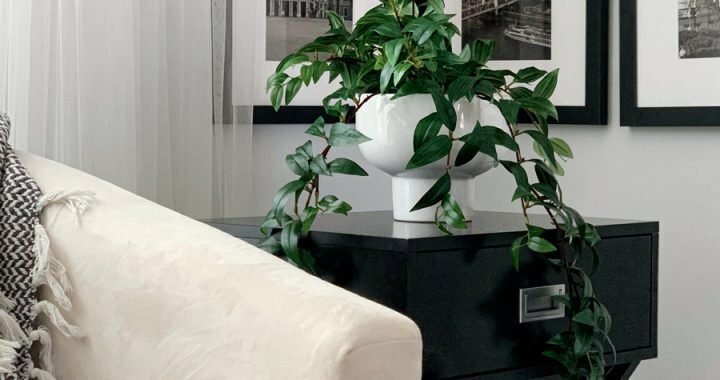 It had a subtle hint of freshness, with a few notes of optimism and a whole lot of positivity; and I immediately began brainstorming ways to bring some of that positive energy indoors. 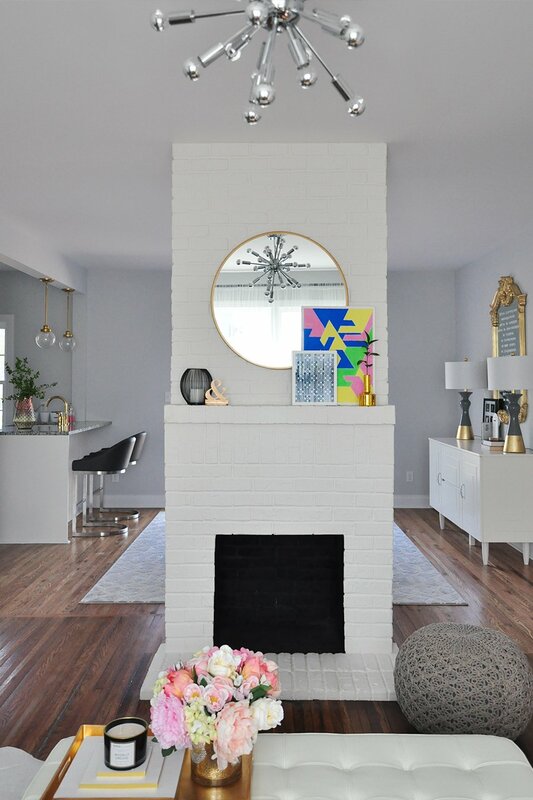 So today I’m showing you three simple ways to style your fireplace decor for spring. 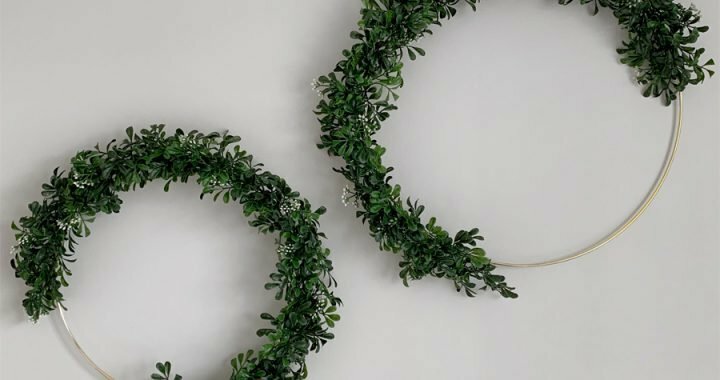 The fireplace is a design element traditionally associated with winter, but there’s nothing like a mantel adorned with freshly cut, winding vines (hopefully of the non-poisonous variety) to brighten up a space for spring. 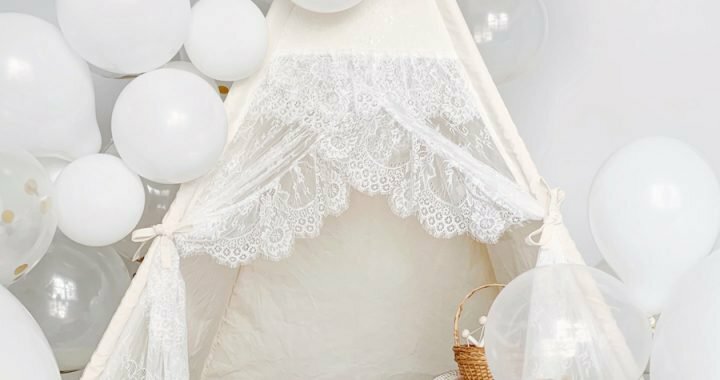 The best part is that you likely already own all of these items – or can easily source them with a quick trip to your backyard. No fireplace? No problem! 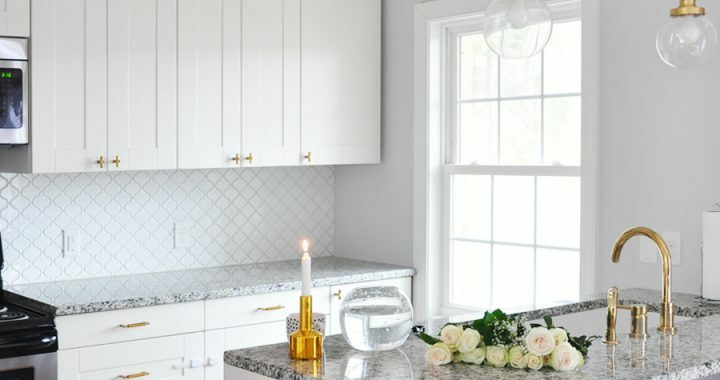 You can easily apply these ideas to any flat surface in need of some springtime styling. The first example, above, involves brightening your space with the use of a bold piece of art. 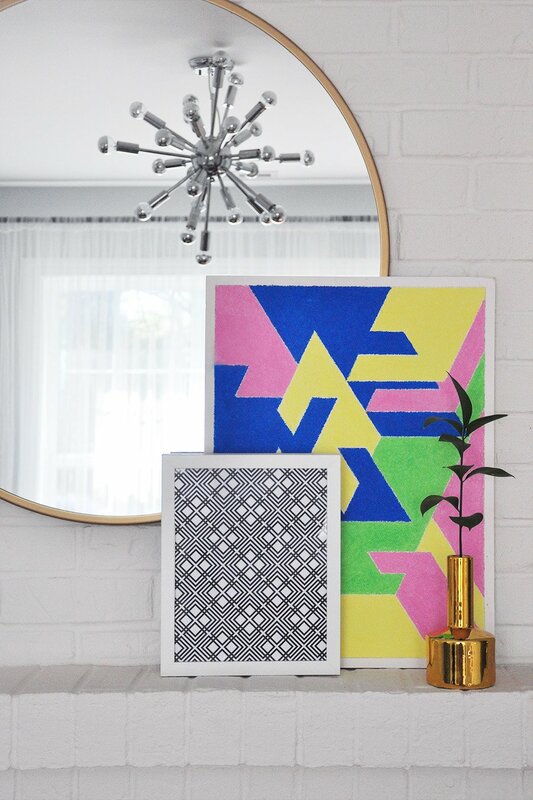 The rest of our house is fairly neutral, so bold-colored artwork instantly elevates the mood of any room and gives it a fresh breath of life, so to speak. Layer the artwork with another piece to keep it from feeling lonely. If you’re feeling extra adventurous, place a single bloom or piece of greenery in a thin vase. To balance out the vignette, I added a fresh spring candle and a fun statuette on the other side of the mantel. The second example, above, is more in line with the neutral palette in the rest of the house. Start with a bunch of freshly cut greenery. Again, I literally went out into the back yard and looked for bushes with nicely shaped branches. I cut off any scraggly-looking twigs and arranged them in a way that looks natural and effortless. Live greenery in a space guarantees an instant pick-me-up. To balance out the vignette, I styled a couple of books – spines facing away to maintain the neutral palette – along with a simple clock and a random ampersand statuette. The third example, above, is my personal favorite. It involves simple, white taper candles and my beloved winding vines for which I braved poison ivy barefoot. With a little coaxing from yours truly, I manipulated the vines to look like one long, continuous vine, when in actuality there are about 4 or 5 short ones. To add interest to the vignette, I used two tall taper candle holders and three short ones. Instead of alternating between short and tall, I mixed them up to keep the design from looking too formal. We typically associate symmetry with formality. Balance, although a similar concept, is more about the overall visual aesthetic of something. A vignette should always be balanced but not necessarily symmetrical. Tell me which of these three ideas is your favorite and how you’re decorating your own place for spring. And if you aren’t – why ever not?! Posted in HOME DECOR and tagged FIREPLACE, INTERIOR STYLING, LIVING ROOM. Oh my goodness this room is gorgeous! Girl, you should be an interior designer because you are seriously amazing! I love every option here. You have such incredible taste! All three are beautiful but I love the greenery with the candles. These are all such cute options! I really love your mantel and fireplace! The greenery with the candles is my fave! You have such a pretty home! All of these options are so cute! I love to have a pop of color on my mantle, and some sort of greenery! I love the mirror over the fireplace! Definitely makes the room look bigger! I don’t have a mantle, but I’m excited to decorate it one day when I do! My parents use theirs for sports memorabilia! I can’t decide if I love the bold art or larger than life branches more! You have amazing taste, Oksana. 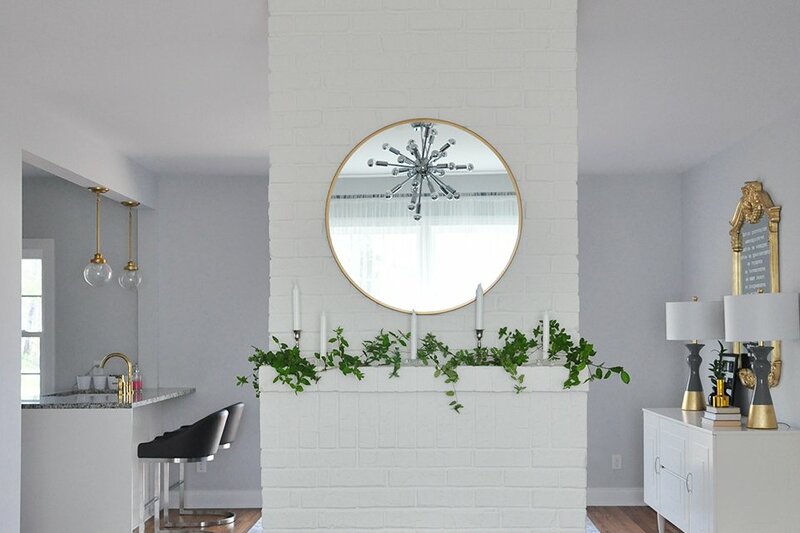 I don’t have a mantle, but I think the third styling option would be nice on the awkward bar/wall thing that separates my kitchen and living room. Those are great styling ideas! I like the 2nd look best! 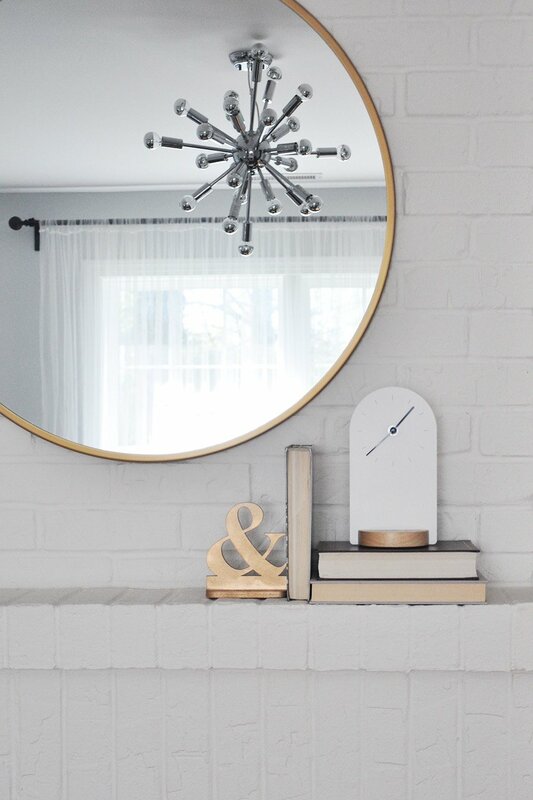 Always love reading your decor posts! You have such great taste! I love all of those! I think the second one if definitely my favorite! This space looks amazing, I always love home decor it is so much fun! All of these mantel options look great, although the second one is definitely my favorite. 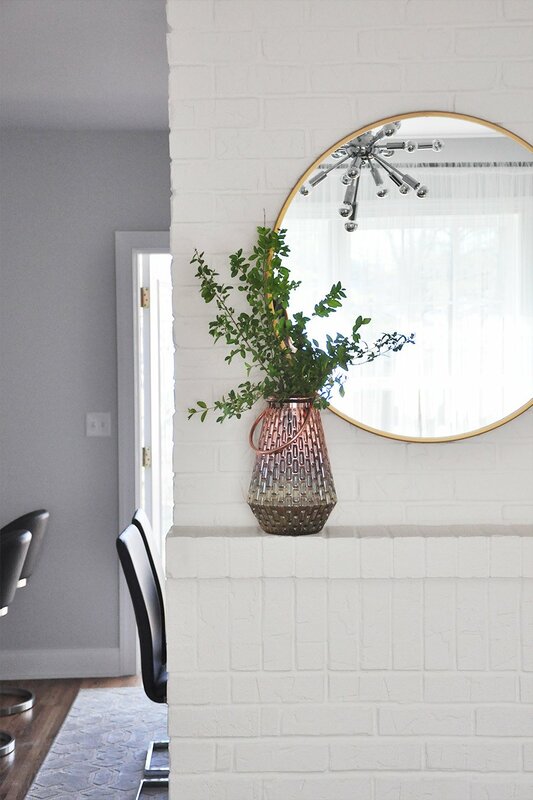 Bringing in either greenery or flora is a must for my spring decor. It really livens up the space and brings the positive, warm vibes of the outdoors in.